Have you always dreamed of writing a children’s book? Susie has classes for every stage of writing. Choose your own writing adventure! This linked set of five-session classes blends hands-on exploration of children’s books with exercises to stimulate ideas and opportunities to present your ideas and writing. In Part I, discover how to structure a successful children’s book with well-developed characters who have strong motivations, compelling conflicts and satisfying resolutions. In Part II, learn tools that focus on showing, not telling, and discover your unique voice. This five-week class zooms in on specific strategies, studies the way currently published authors are using them, and then, using prompts, class members practice and gain feedback on their results. Participants can use this class to generate new material or develop a work-in-progress. Topics covered will include the successful use of sensory descriptions, effective dialogue, and vivid verbs. Keep going with continuing critique classes under Susie Wilde’s leadership in a comfortable collegial setting with children’s book writers who hone their own work and strengthen skills through critiques. Reading their stories in the company of other talented group members, participants listen, evaluate and offer beneficial comments and suggestions to improve evolving manuscripts. Day, evening, and biweekly critique sessions are available, limited to six serious writers each. 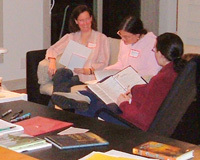 Participants must have completed both I’ve Always Wanted to Write a Children’s Books sessions, or have obtained prior approval. “Susie's expertise and enthusiasm has guided me in creating a deeper, more developed character, a stronger writing voice and the belief that I am truly a writer." “I'm working on a book now, something I've always wanted to do, but couldn’t have done without taking Susie's classes. She not only meets writers wherever they are on the skills continuum, she coaxes out ideas and strategies for developing them." "I joined Susie's critique group three years ago. In that time, I've watched fellow members complete manuscripts, attend conferences, get agents, and even sign contracts with major publishing houses. Instead of feeling intimidated, Susie has inspired me to believe that it can happen to me, too. I can't imagine being on this journey without her!" To sign up for a class or join a critique group, contact Susie. For upcoming dates, times and locations, check out the Events page.